The AXIS Nova from Kratos Analytical is a highly automated x-ray photoelectron spectrometer with the uncompromised spectroscopic performance required for challenging research applications. The AXIS Nova has an extremely compact footprint and incorporates market-leading AXIS technology, including magnetic immersion lens, coaxial charge neutralization, delay-line photoelectron detection, and completely automated sample handling. High energy resolution and high sensitivity, is ensured by the large radius hemispherical sector analyzer (HSA) in spectroscopy mode. Small spot spectroscopy is achieved by inserting an aperture into the electrostatic lens column; forming a virtual probe at the surface. 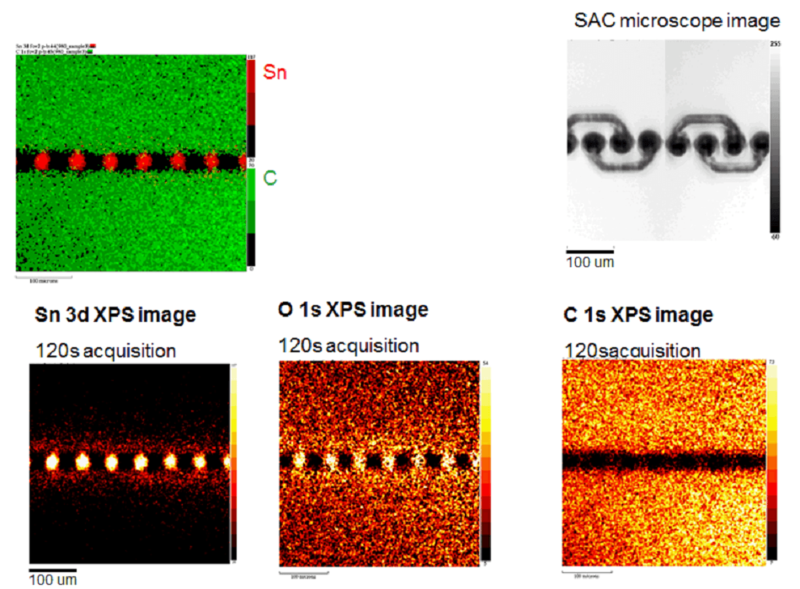 Issues regarding sample charging and X-ray-induced degradation associated with micro-focused X-ray sources, are removed using this approach to small area analysis. It is possible to acquire small spot spectra from areas as small as 15 µm diameter from any point within the field of view of the lens. The position of the virtual probe can be deflected across the surface of the sample using a unique electrostatic deflection system. It is possible to define the position for the acquisition of small spot spectra with a simple mouse click from a parallel photoelectron image, with no need to translate the sample. Alternatively, the high resolution in-situ optical microscope image of the sample may be used to define the XPS analysis position directly. The X-ray source on the AXIS Nova is based on a large 500 mm Rowland circle geometry; guaranteeing less energy dispersion in the focused X-ray spot than systems based on smaller Rowland circles. This ensures the highest energy resolution, as demonstrated by a FWHM <0.48 eV for Ag 3d. In order to obtain ease of alignment of the X-ray spot with the analysis position, the Al Kα X-rays are monochromated by a single toroidal backplane. The X-ray anode is engineered to allow movement of the anode surface with respect to the cathode. This new anode surface may be exposed as required, without breaking vacuum. The useful lifetime of the anode is significantly increased with the availability of 10 anode positions. The Kratos patented spherical mirror analyser (SMA) allows real time photoelectron images to be acquired so that elemental or chemical differences that are not visible by optical inspection of the surface can be rapidly aligned to the analysis position. 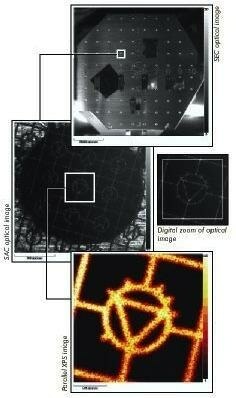 Properties of the SMA mean that the images acquired with this analyser have both high energy and lateral resolution. Combining this with the pulse counting delay-line detector provides the ability to generate truly quantitative chemical state information from the uppermost surface of a sample. The speed of parallel image acquisition offers the clear the advantage of reducing X-ray exposure to delicate samples. At the highest image magnification 3mm spatial resolution is guaranteed. The AXIS Nova may be configured with either a high flux monatomic Ar+ ion source or the more versatile Arn+ Gas Cluster Ion Source (GCIS). Both ion sources are fully integrated and controleed through the ESCApe software, providing an easy User interface for depth profiling and sample cleaning. The monatomic Ar+ ion source (Minibeam 4) has continuously variable beam energies between 4 keV and 50 eV. A bend for neutral suppression, as well as the potential to operate in floating mode, producing high current densities at low ion energies, are both incorporated by the precision ion column, resulting in enhanced interface resolution and fast etch rates, even at low ion acceleration voltage. The Minibeam 6 Arn+ GCIS allows the selection of a mean cluster size between 500 and 3000 atoms. Cluster ions may be accelerated up to a maximum of 20 keV such that the energy per atom, or partition energy, can be varied from <2 eV (5 keV, Ar3000+) to 40 eV (20 keV, Ar500+). Control over the cluster parameters means that the ideal combination can be chosen for the material to be sputtered. 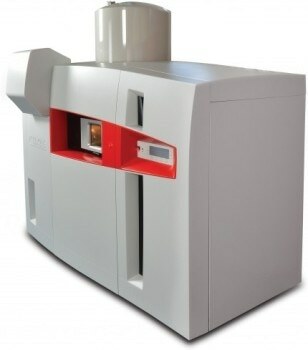 10 keV Ar3000+ large, low energy clusters are ideal for sputter depth profiling organic material and multilayers whilst 20 keV Ar1000+ small, high energy clusters are used for sputter profiling inorganic materials with retention of chemistry throughout the profile. 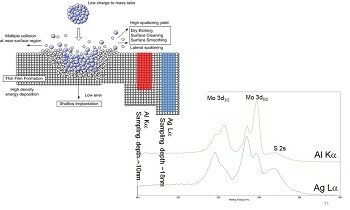 The GCIS may also be operated in monatomic Ar+ mode for depth profiling metals or inorganic materials. It can also be used to generate He+ primary ions for ion scattering spectroscopy (ISS) completing its multi-mode capabilities. The AXIS Nova charge neutralizer is based on established market-leading technology which is used in more than 250 AXIS spectrometers. 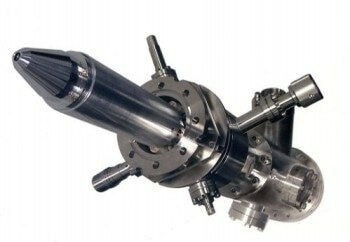 The use of a coaxial low energy electron source within the field of the magnetic lens guarantees that the ultimate base pressure of the spectrometer is maintained during analysis of insulating samples, in contrast to other neutralization systems which need an extra source of Ar+ ions. The design of the Kratos neutralizer has been significantly improved so that it ensures that the system is self-regulating and works efficiently on all classes of insulating materials, including fibers, thin films and powders. 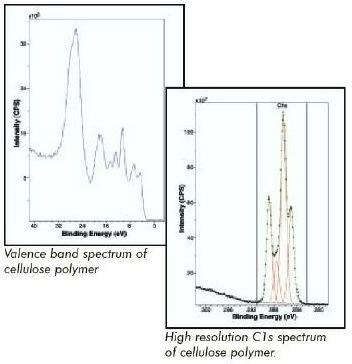 When used in conjunction with the monochromatic X-ray source, it could be possible for spectra with unrivaled energy resolution to be generated from electrically insulating materials, as demonstrated by data showing FWHM of <0.68 eV on the ester component in polyethylene terephthalate (PET). Kratos Analytical maintains its lead in the development of imaging X-ray photoelectron spectrometers with the introduction of the delay-line detector (DLD). The DLD represents the next generation of photoelectron detectors; providing a single pulse-counting detector for both imaging and spectroscopy experiments. The DLD occupies the heart of the AXIS Nova; comprising of a multi-channel plate stack above two orthogonal delay-line anodes and associated electronic control units. The DLD has a large active area, comprised of 128 channels for photoelectron detection in spectroscopy mode. The increased number of channels means that, in addition to collecting photoelectrons in usual energy scanning mode, the spectrometer can further be used to collect spectra with 128 data points without scanning the analyzer; this process is also called ‘snapshot’ spectroscopy. This mode enables the collection of an individual photoelectron peak in less than 1 second, offering obvious advantages for data acquisition during dynamic surface characterizations or depth profiling. Photoelectrons with 2D spatial distribution are incident on the DLD when used in parallel imaging mode. The electron arrival position on each of the two delay-line anodes is converted by the fast DLD control electronics into an x, y coordinate for every electron event. Combining the signals over several seconds enables the generation of truly quantitative chemical or elemental images of the surface over a 65,500 pixel array. In the highest magnification imaging mode, the spatial resolution at the surface is <3 µm. One main advantage of the digital DLD technology is that the system has inherent low noise characteristics, with assured spike immunity. The AXIS Nova sample handling and platen navigation system combines in-situ optical microscopes with the acquisition software for rapid, easy definition of sample analysis positions. It is possible to save both full platen, (110 mm diameter field of view), and high magnification, (2 mm field of view), optical images into an experimetnal file, and recall for sample positioning. Users can see the platen in the analysis chamber with the aid of a large view port; providing complete confidence in sample location. Up to 3 large sample platens can be loaded onto an elevator in the sample entry chamber. Automated multi-platen exchange allows platen transfer from the entry chamber to the analysis position without User intervention. With over 285 cm2 available for sample mounting the AXIS Nova provides scope for unrivalled sample throughput. 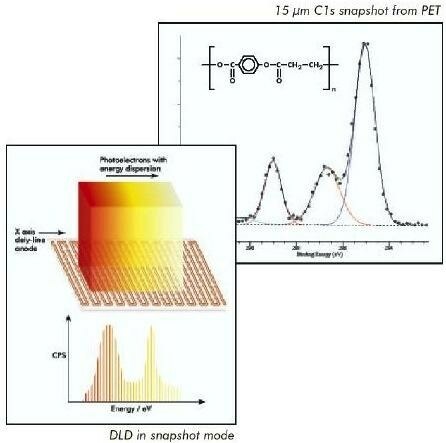 Specific sample platens are provided to tilt the samples relative to the analyser for angle resolved XPS, whereby data can be used to reconstruct concentration depth profiles from the uppermost 10nm. Also provided is a platen to allow rotation about the vertical axis during sputter depth profiling. 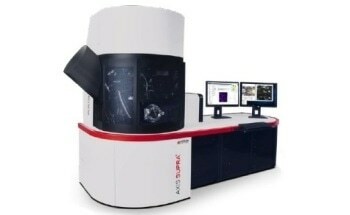 The AXIS Nova is an automated, state-of-the-art spectrometer which incorporates market-leading AXIS technology, including magnetic immersion lens, coaxial charge neutralization, delay-line photoelectron detection, and completely automated sample handling. Excellent sensitivity and resolution in spectroscopy mode is complimented by fast XPS imaging and selected area, small spot spectroscopy.